Barcelona, September 2017 - Over a dozen of specialised trade media from all over Europe joined the press visit organised by European Plasticisers and sponsored by VinylPlus. 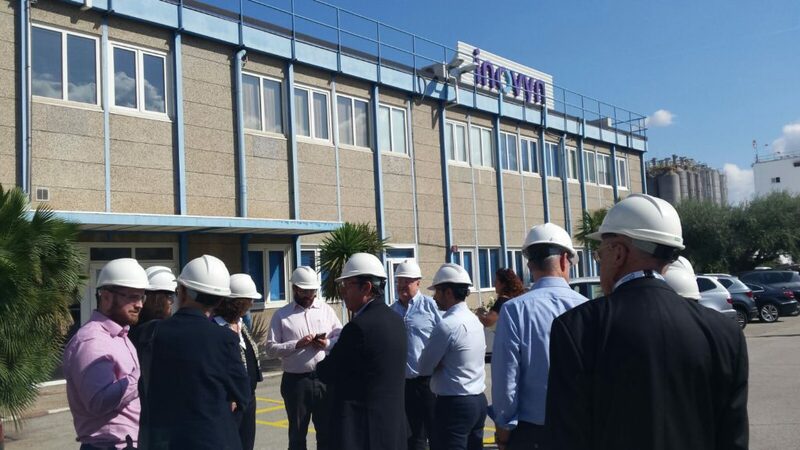 They had the chance to visit Renolit Iberica and Inovyn, two major players in the European PVC landscape. On the first day journalists were introduced to the diverse world of plasticisers, their applications and benefits. Michela Mastrantonio, Manager of European Plasticisers, provided an update on the latest regulatory developments and showcased a number of initiatives the plasticisers industry is carrying out to promote science, transparency, awareness and sustainability. “We have been organising media visits for five years in a row. They are a great way to show how the PVC industry works, how products are made and what the industry is doing from an innovation and safety point of view. It is vital for European Plasticisers to have a constant dialogue with journalists”. Beatriz Meunier, from Plastics Europe, did a presentation focusing on sustainability and the achievements of VinylPlus, the voluntary sustainability initiative of the PVC value chain. In 2016 all the companies participating in this programme recycled 568,696 tonnes of vinyl. The day continued with a presentation from Renolit, a leading company in flexible PVC conversion specialised in the manufacturing of waterproof roofing membranes for swimming pools as well as civil engineering. Its General Manager, Frédéric Weemaels, explained how stadiums, metro tunnels and solar panels are benefiting from the technology developed by Renolit, proving the versatility and durability of flexible PVC. During the plant visit, the journalists could follow the manufacturing process, from the formulation using specific plasticisers for different applications, to the printing and packaging of the finished membranes and films. The visit ended at the company’s recycling facilities for post-industrial materials, a project confirming Renolit’s commitment to sustainability. On the second day, the journalists got the chance to hear about Zicla, a Spanish company designing and producing road installations, traffic separators and some very specific safety applications in the transport sector using recycled plasticised PVC and hence closing the loop of the vinyl life-cycle. This was followed by a visit to the Inovyn plant. Walking through the chemical plant of Europe’s leader in PVC resin manufacturing, the journalists discovered the technology behind the material that makes endless PVC applications possible. “By offering this on-the-ground experience, European Plasticisers made another step to build a wider awareness about the benefits of flexible PVC and contributed to uncovering the expertise, the technology and the passion behind the vinyl industry,” concluded Mastrantonio.